The analogy alludes to the challenges the economy is facing...or maybe the swans are just a bit dirty. 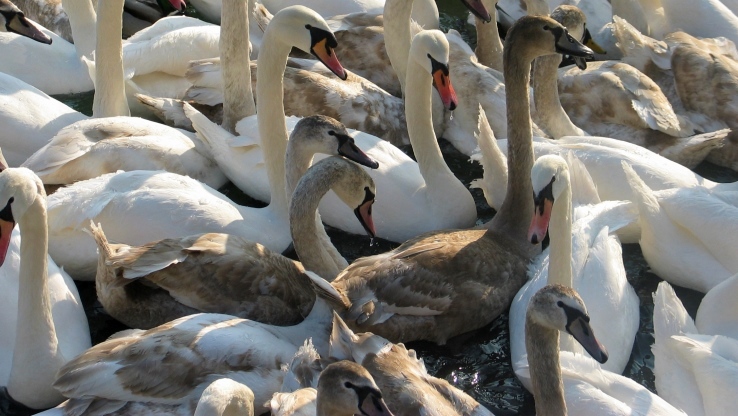 A flock of “Grey Swans” will determine how soon the world economy can take flight. Adding a twist to Nassim Taleb’s infamous “Black Swans” — troublesome events with huge consequences that are largely unexpected — WPP Plc Chief Executive Officer Martin Sorrell has frequently spotted the lighter shaded bird that resembles challenges for executives and investors that are well known about beforehand even if the outcome is still hard to predict. On Sorrell’s latest list are doubts over when the Federal Reserve will raise interest rates and what the fallout will be in financial markets. He’s also concerned by the referendum on whether the U.K. should leave the European Union that is slated to be held by the end of 2017. Such obstacles, alongside already weak growth and inflation, mean clients are “unwilling to take further risks,” Sorrell’s WPP, the world’s largest advertisement agency, said last week. Similarly concerned about animal spirits among executives are the economists at JPMorgan Chase & Co., who are relying on an improvement in the health of companies to pep up the world economy in the current quarter after the summer swoon. Like Sorrell, they also fret business leaders have been spooked by recent events. Their worries are topped by the downdraft in emerging markets alongside the slowdown and August devaluation in China. There was some positive news on Monday when manufacturers around the world reported an increase in activity in October. While the U.S.’s purchasing managers’ index stagnated and gauge for China signaled contracted, the overall global measure bounced from its lowest since September 2013 to 51.4, according to JPMorgan. Of the 24 countries that have reported data, 15 registered increases. The move up is “sending an encouraging — albeit still-early — sign that the unusual funk global manufacturing has been in for most of this year is turning a corner,” said Lupton. Even better news is evidence that spending on goods outpaced production in recent months, meaning a rebuilding of inventories may be on the way. There are also suggestions profit margins have stabilized. That leaves JPMorgan seeing the chance of an upward revision of its forecast for the global economy. It currently predicts growth of 2.8 percent in this quarter after 2.5 percent in each of the prior two periods. Lupton hopes Chinese policy makers have now put a floor under their economy and that it will be enough for executives to begin investing and hiring. He also reckons the Fed is on track to finally raise interest rates in December. A test will come as soon as Friday when the U.S. releases its employment report for October after the labor market lost some momentum. JPMorgan predicts payrolls to advance 175,000, which would be the most since July.